Special Correspondent from Boston, Nov 12 (Just News): “The US is taking a tougher stance on Bangladesh elections this time. As I have heard from concern people at the State Department, their view is they are going to try that this election is going to be fair and credible. 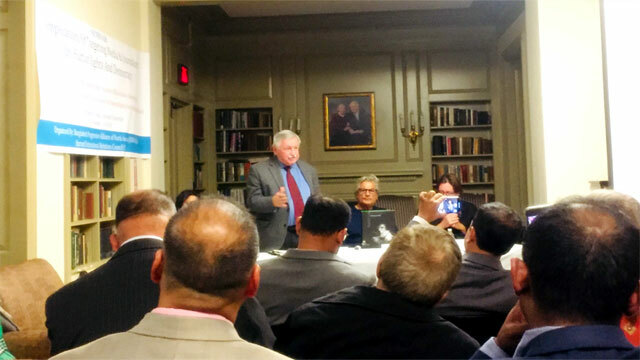 William B. Milam, Senior Scholar of Woodrow Wilson Center, Washington DC, also the former US Ambassador to Bangladesh, came up with this view on Bangladesh issue at a seminar at Pforzheimer House at Harvard University, US, on last Saturday. “What is happening in Bangladesh is politics is failing. There is climate of fear in Bangladesh. Journalists and critics have been practicing self-censorship. Majority intellectuals have chosen to be silent. Government critics have either silenced or compromised with the government to avoid jail terms as that would be inevitable’; said Mr. Milam. “I witnessed struggle for freedom and democracy in late 80s and 90s in Bangladesh and I know most of the people who are involved in it. Many of them were involved in freedom struggle from Pakistan. Surprisingly many of them have come out again and trying to take the country back to the center and towards a democratic future. They risked their lives in 70s and 90s and they are risking their lives again to establish democracy. What they really want is Bangladesh moves towards a democratic future”; the renowned diplomat observes the current political alliance movement in Bangladesh. “Will this movement succeed? Well, this is a very tough uphill battle”; added Ambassador Milam. Bangladesh Progressive Alliance of North America (BDPANA) and Harvard International Relations Council (IRC) jointly organized the seminar on “Implications of Targeting Media & Journalists on Human Rights and Democracy”. BDPANA President Mozammel Al Hossaini and IRC President Eliza Ennis jointly conducted the seminar where Dr Sherman Teichman, Senior Fellow, the Carr Center for Human Rights, Harvard Kennedy School, Aliya Iftikhar, Asia researcher of Committee to Protect Journalists (CPJ), Adem Carroll, UN and New York Programs Director, Burma Task Force, UN & White House Correspondent M Mushfiqul Fazal, BDPANA general secretary Tanvir Newaj, Sadek Kamal, professor of Brandeis University and Azad Khan, among others, were present. Dr Sherman asked the Bangladesh government to release internationally reputed journalist Shahidul Alam immediately. Adem said the Bangladesh government is done great in terms of hosting so many refugees. However, removing refugees to islands like Bashanchar is not safe. And it is not yet time to repatriate Rohingya to Myanmar, without their rights and property property returned and safety guaranteed. They do not deserve to be put in detention camps as we see with the Uighur people in China too. Mentioning eminent photo journalist Sahidul Alom situation she said “Sahidul Alom faced physical tortured under police custody, which is very inhuman. Having all the ground his bail is not been granted." Aliya demands Alom immediate release. In his speech Journalist M Mushfiqul Fazal said, “All autocratic rulers firstly targeted media to prolong their illegitimate tenure. In Bangladesh you have freedom of speech but it has to be the in favor of the government-"